A warmly engaging culinary memoir. How to Cook a Moose is as lush, lean, and hardy as the region that inspired it. I devoured every word of ￼this beautifully written book. How to Cook a Moose is part of a long proud literary tradition that asks: Why do we Americans feel the need to start over? How do we do it? And with whom? And where? Christensen is one of our best, most versatile writers, and her latest is a terrifically smart, funny, disarming story about how we get where we’re meant to go, and what we might eat when we get there. How to Cook a Moose is Kate Christensen’s gorgeously composed love letter to Maine, its people, and its food. Like Maine itself, it is both cozy and rugged, grounded in a powerful sense of place. One of our finest novelists is one of our best memoirists and food writers, too. Hoping to hear when you’ll be doing a book launch in Portland. Thank you for asking! The local launch for “How to Cook a Moose” will be at at Sonny’s in Portland on the 22nd from 5-7, sponsored by Longfellow. I’m reading at the Falmouth Library two days later on the 24th, and I’m also doing a Brown Bag Lunch at the Portland Public Library on November 18th. I hope to see you at one of these! 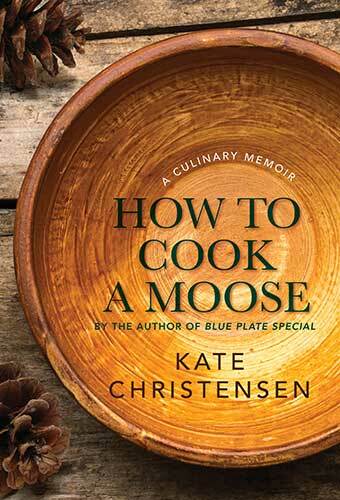 Hi Kate – I just finished “How to Cook a Moose” and thoroughly enjoyed it all. I’ve been a fan of yours for years and love your writing style, books and blog. As a fellow New England transplant (also from Manhattan), I can relate to much of your descriptions of New Englanders in general and Maine in particular. I moved to New England following a divorce and also meeting a younger man who grew up here. (We live in Northwest Connecticut bordering on the Massachusetts state line.) We bought and furnished a lovely home from scratch, married in the fall later that same year (2007) and adopted and raised a puppy who is now 6 years old and travels with us when possible. So much of your recent book and your previous memoir I can personally relate to as it often feels as if you’re telling my life story. I’m one of 3 daughters (oldest), mid-50’s, no children (by choice), love to eat and cook fresh and seasonal, drink wine, take daily walks with our dog, read, travel and meet new people. Mostly, I feel blessed to have someone to share it all with who enjoys it as much as I do. For the past 5 years, we have spent much of the month of August up in Mid-Coast Maine in the Portland/Casco Bay region. Because I have the luxury of working from home when I’m not traveling, we rent a small cottage and live and eat like the locals. Thanks for sharing all the wonderful people, places and their stories that you have discovered since moving to Maine. You have given us several great ideas of new places to explore. With kind regards. I heard a story about her on Maine Calling… she was a Chinese immigrant who ran a laundry in Portland and put all her kids through school single-handedly? My mother should have won a Mother of the Year award, but she’s not the one you’re thinking of. I wish I could remember the name, but best of luck finding her.